Both cats and dogs can suffer from kidney failure. Unfortunately, the symptoms may not be noticed until it has become severe; however, there are many treatments and alternatives available before facing the decision to euthanize your pet. 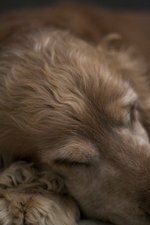 Kidney failure is also known as canine kidney failure and is a common problem found in older dogs. Kidney failure progresses slowly and may go unnoticed for a long time before symptoms may show. By the time the symptoms are noticed, it may be too late. Kidney failure typically stems from being poisoned or ingesting some kind of toxin, according to Healthyhappydogs.com. One of the first symptoms of kidney failure is a noticed increase in thirst and excessive urination. This is because when the kidneys are damaged, the body uses more fluids. As the problem progresses, other symptoms may be nausea, fatigue, weight loss and a decrease in appetite. Beginning treatment of kidney failure includes a change in diet. Feeding your dog a low-sodium, low-protein and low-phosphorus diet may be suitable. A low-phosphorus diet may aid in slowing down the progression of kidney failure. The specific diet plan should be made around every individual animal's needs. Nutritional supplements like omega-3 fatty acids from fish oil may also be able to slow the progression process of kidney failure. Omega-3 can offer anti-inflammatory values that can reduce the kidney inflammation. Vitamin B complex and vitamin C can help replenish the lost vitamins. Vitamin C may also help to increase the dog's appetite and to feel better. Anti-hypertensive medications that include ACE inhibitors may also be given. Reducing stress for a dog with kidney failure can help give him a better quality of life. Natural flower essences and acupuncture may help in reducing stress for your dog. According to Healthyhappydogs, regular acupuncture may even help in slow the progression of kidney failure. Flower essences and acupuncture are both safe to use alongside conventional and alternative treatment for kidney failure. Euthanasia for kidney failure should be considered when all treatments have been tried, and the dog is only getting worse. When your dog stops responding to treatments, and his fight to live is gone, then it is time to think about euthanasia. Other signs that it is time for euthanasia is when your dog is in constant pain, when your touch does not soothe him or causes him pain, and if he stops eating or drinking. Your dog may suffer from incontinence due to complete kidney failure. You should consult with your veterinarian about euthanasia and if he sees any possible improvement in the future before making your decision. Some animals can live for months or even years after being diagnosed with kidney failure. All animals respond differently to the various treatments. Cats seem to fair better than dogs do with kidney failure, but with proper treatment, you may be able to give your pet a happier and longer life.